World Chess Federation congratulates the FIDE President Arkady Dvorkovich on his birthday! The FIDE family wishes Mr. Dvorkovich on this day the best of health, happiness, energy, optimism and success! ST. VINCENT & THE GRENADINES CHESS FEDERATION LAUNCHED! The evening of Monday, March 4, 2019 saw history being created in St. Vincent & The Grenadines with the launch of the country’s Chess Federation at the Music Centre in Kingstown, the nation’s capital. The newly established “St. Vincent & The Grenadines Chess Federation” (“SVGCF”) was greeted with much enthusiasm and excitement by the approximately thirty persons present, including students. This significant event in the country’s life was spearheaded by two Vice-Presidents of the World Chess Federation (“FIDE”) - celebrated English International Chess Grandmaster Nigel Short and Ian G. Wilkinson QC, also the President of the Jamaica Chess Federation, who visited the island between March 2 and 5. The formal launch was chaired by Wilkinson. Prior to the launch of the SVGCF both men met with important stakeholders including Dr. The Hon. Ralph Gonsalves the country’s Prime Minister; the Hon. Cecil McKie, Minister of Tourism, Sports and Culture; the Hon. St. Clair Jimmy Prince, Minister of Education; and Members of Parliament Godwin Friday, the Leader of the Opposition, and Major St. Clair Leacock. Both men also conducted “simultaneous exhibitions” which involve playing many persons on different chess boards at the same time. On Sunday March 3, Short (1993 World Chess Championship Finalist and three-time Commonwealth Chess Champion) took on seven players and won all the games. On Monday March 4 after the launch of the SVGCF, Wilkinson (a two-time Jamaica Veterans’ Chess Champion) faced six players, won five games and drew with a high court judge. The SVGCF has established a seven-man steering committee led by Senator Israel Bruce, Attorney-at-Law, who was instrumental in facilitating the visit of the FIDE officials and providing logistical support. This Committee will finalize all the relevant arrangements by March 31, 2019 so that the SVGCF can apply for membership in FIDE. Bearing in mind the many benefits of Chess (including making students better, developing self-esteem, exercising and developing the brain/mind, teaching responsibility for one’s actions), the SVGCF has plans to promote Chess throughout the length and breadth of the country; introduce a Chess-In-Schools programme; organize national championships; and participate in international events such as the World Chess Olympiad. * Average Rating of Opponents, excluding the lowest-rated opponent. ** Buchholz score reduced by the lowest score of the opponents. The 3rd FIDE World Cadets Rapid & Blitz Chess Championships 2019 will be held in Minsk, Belarus, from 15 August (arrival) to 19 August (departure) 2019. The venue is the Minsk Sports Palace. FIDE President Arkady Dvorkovich and Advisor to the FIDE President Berik Balgabaev paid a visit to Ho Chi Minh City in Vietnam on March 13th and attended the awarding ceremony of the 9th HD Bank International Chess Tournament. FIDE officials had a number of meetings with representatives of the Vietnam Chess Federation - President of VCF Nguyen Dong Tien, Vice President Dang Tat Thang, and general sponsors and partners - Madam Nguen Thi Phuong Thao - Permanent Vice Chairwoman of HDBank and BOM of HDBank and VietJet Air, Deputy General Director of HDBank, Le Thanh Trung. During the reception at HDBank`s Head Office they discussed different topics, including plans of future cooperation. FIDE President Arkady Dvorkovich’s welcomed all participants and personally awarded the champion of HDBank 2019 Chess Tournament Chinese player Wang Hao, who scored 7,5 out of 9 to become the sole winner. Since 2011 the HD Bank International Chess Tournament was as an important platform to help Vietnamese chess talents reach the global arena. The largest international event of Vietnamese chess has been attracting the world’s top players to Vietnam. Q1PB-2019/01 To approve the principle of reduction of FIDE fees. Q1PB-2019/02 To approve the signing of the Liability Insurance contract for PB members. Q1PB-2019/03 To approve Baku as the possible organizer of the next Presidential Board. Q1PB-2019/04 To approve the recommendation for the organization for an Extraordinary GA in October 2019. Q1PB-2019/05 To approve a representative of each continent to join the Task Force on the Reform of the FIDE Statutes and FIDE Handbook. Q1PB-2019/06 To approve QC to deal with the transfers of players and to review transfer of players regulations. Q1PB-2019/07 To approve that FIDE keeps using Swiss Accounting Standard as recommended by E&Y and order the management to disclose more information related to the management activities. Q1PB-2019/08 To approve a panel to deal with the financial support to Seniors players and former FIDE Officers. The panel will include Jan Rooze (BEL), Emil Sutovsky (ISR), Mikhail Krasenkow (POL), Willy Iclicki (LIE), Anastasia Sorokina (BLR) and Tahar Batikh (TUN). Q1PB-2019/09 To acknowledge the FIDE President’s decision to finance training and seminars for arbiters, especially for those from Asia and Africa, as well as for female arbiters, from the general Development fund. Q1PB-2019/10 To approve the application of St. Lucia Chess Federation and Guinea Equatorial Chess Federation and to grant them the statute of provisional members of FIDE. Q1PB-2019/11 To acknowledge the FIDE President’s decision to create a centralized IT infrastructure within FIDE and to develop a “one-window” system of funding for online activities. Q1PB-2019/12 To acknowledge the FIDE President’s decision to create a procurement department and to make the Secretary of the Management Board Vadim Tsypin (CAN) responsible for procurement issues within FIDE. Q1PB-2019/13 To approve the members of the Fair Play Commission. Q1PB-2019/14 To agree that Arbiter's Commission will set up the criteria and will provide a list of arbiters from which the appointments are to be made. However, the decision about the appointment for the events are to be made by GSC. Q1PB-2019/15 To approve the selection of arbiters for the FIDE World Championship event by the Arbiters’ Commission based on the Commission’s guidelines based on chess knowledge, geographical location, gender and age and representation of all Continents. Q1PB-2019/16 To approve the signing of the Continental Development Project Contract with the four continents. Q1PB-2019/17 To approve the regulations for the 2020 World Chess Championship Candidate Tournament. Also to set a recommended prize fund of 2 Mln Euro for the Title Match. Q1PB-2019/18 To approve GSC proposal to ban draws by mutual agreement before move 40 in Candidates and World Championship Matches starting 2020. Q1PB-2019/19 To approve GSC proposal in regards to the tie-break criteria for the Swiss-system events of the World Championship Cycle. Q1PB-2019/20 To confirm that Spain keeps the right to organize the 2019 World Blitz and Rapid Youth Championship. Q1PB-2019/21 To grant an organizing committee led by John Lluton the right to hold the 2019 World Inclusive Cadet and Youth Chess Championship as a pilot project in Cardiff, Wales. Q1PB-2019/22 To ask the DIS commission Chairman and Secretary to join the Cardiff organizing committee and to provide necessary guidance so that the 2019 World Inclusive Championship could be expanded to a larger event that would include adults. Q1PB-2019/23 To ask FIDE VP Akaki Iashvili and the DIS Commission to prepare regulations for the World Inclusive Junior and Adult Chess Championship. Q1PB-2019/24 To approve the titles proposed by the QC, ARB, TRG and EVE commissions. Q1PB-2019/25 To confirm the new Addendum to the Agreement with World Chess., approved by absentee voting in January 2019. Q1PB-2019/26 To approve the concept of the yearly FIDE Awards to be presented during a FIDE Gala. Q1PB-2019/27 To approve the composition of a permanent panel that would determine the exact categories, format and dates for the FIDE Awards. The panel is formed as follows: Mohd al-Mudahka (QAT) – Chairman, Berik Blagabaev (KAZ), Vadim Tsypin (CAN), Jacob Aagaard (SCO), Eva Repkova (SVK). Q1PB-2019/28 To appoint FIDE Vice-President Mahir Mammedov (AZE) a Chairman for the Commission that would award the Fair Play S. Gligoric Trophy and to ask Mr. Mammedov to recruit two more members of the commission, including at least one woman. Q1PB-2019/29 To let the President to create a panel to nominate the FIDE Honorary Members and other Honorary titles. Q1PB-2019/30 To consult a Fischer Random Chess expert panel including Eugene Torre (PHI), Nigel Short (ENG), Gunnar Bjornsson (ISL), Berik Balgabaev (KAZ) and Jeroen Van den Berg (NED) to propose in the next two weeks recommendations and guidelines for the 2019 Fischer Random World Chess Championship. Q1PB-2019/31 To consider the nomination of a minimum of 25% of women in overall FIDE Commissions. Q1PB-2019/32 To approve the African continental report and the creation of the zone 4.5 with further ratification by GA.
Q1PB-2019/33 To approve the idea to preserve the good image of our game endorsing the proposal regarding the dress-code. A panel including Anastasia Sorokina (BLR), Emil Sutovsky (ISR) and David Llada (ESP) will report with recommendations to the next PB. Q1PB-2019/34 To send an inspection team to Ugra in May 2019 in order to assess how Khanty-Mansiysk prepares for the 2020 Olympiad. The team shall be led by the official 2020 liaison and shall include at least one more Management Board member. Dvorkovich: "FIDE has a direct income from its first sponsor Russian Railways"
The opening day of the World Team Championships 2019 in Astana was intensive for Arkady Dvorkovich. FIDE Press Officer in Astana Yannick Pelletier was allotted a few minutes in the FIDE President’s tight schedule to ask him some questions. Yannick Pelletier: The FIDE Presidential Board meeting is being held today in Astana. Can you reveal some of the main decisions taken here? Arkady Dvorkovich: Many issues are being discussed of course, but I would like to highlight two major points. The first concerns FIDE’s contribution to the development of chess both on continental and on national level. Cooperation agreements are in the making with the presidents of the four Continental Federations (they were signed later in the evening – YP). The second point is no less important, since we are working on the World Championship Cycle. The Regulations of the Title Match and the Candidates Tournament will soon be ready for publication, which will naturally launch the bidding procedure for these events. YP: You have also just met with Kazakhstan Prime Minister Askar Mamin. Bouncing back on your last answer, did you talk with him about the further development of chess in the country? AD: Yes, Chess in Kazakhstan is becoming increasingly important and popular. One of the goals of the government in the short term consists in introducing chess in all schools. They also run chess academies, which contribute to improving the level of their top players. The women team is young and already very strong, they might soon become a fierce candidate for the podium in international competitions. The men’s team is not yet as good, but they have room and means to improve. Moreover, this event shows the organizational capacities of Kazakhstan. Bear in mind that they only had one month to prepare this World Team Championship, and I can certify that everything has been done at the highest level. The AIFC offers ideal conditions to host this event. This is a clear sign that Kazakhstan is responsive to stage other competitions in the future. YP: Could you please describe for us how you use your past experience in the Russian government as well as your knowledge of economy and management for the good of FIDE? 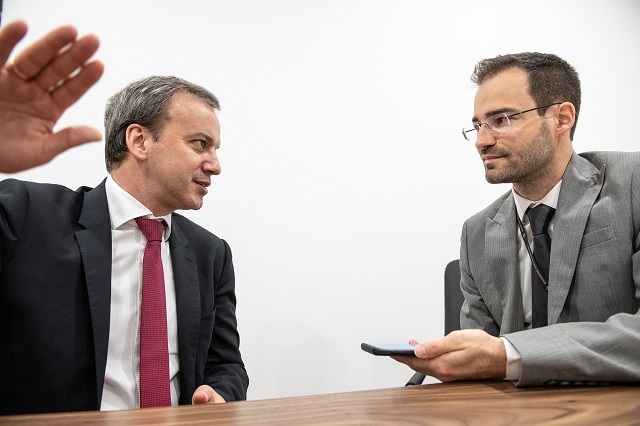 AD: To some extent, the idea to run for FIDE President was based on the understanding that I can use my skills and connections to improve the situation of FIDE. And it is exactly what our team is doing now, by exploring options which were not available before. I meet top business men, leaders of countries, and send them strong signals regarding our objectives to improve FIDE and the visibility of chess. Our duty is to explain to them how chess can be used as an educational tool to increase the intellectual capacity of their country. And so far that works, people are receptive. Step by step this brings more attention and resources to chess. I also use my experience as a manager internally to build a new structure for FIDE and new relationships with national and continental federations. It is important to create teams with special skills that are crucial for improving FIDE as a driving institution for chess all around the world. YP: You mention the receptiveness of the potential partners you are discussing with. Has there been any concrete result in terms of sponsors so far? AD: Yes, actually we started with tournaments already. For instance the World Rapid and Blitz Championships in St Petersburg was organized under the umbrella of King Salman, but also with additional resources from other sponsors. This helps the financial position of FIDE too, as it indirectly lightens the budget. And now FIDE indeed has a direct income from its first sponsor Russian Railways. YP: Can you tell us how these funds will be used within FIDE? AD: Most of these funds will be reinvested for chess. A large portion of our 3-million-euro budget will be used for development purposes and directly injected into projects by Continental and National Federations, like chess in schools. We will also allocate part of it for the training of arbiters, organizers, and for chess academies. On the other hand, money that we receive from the tournaments will be used to finance current activities of FIDE. YP: A few significant modifications have been brought to the formula of the World Championship cycle. What impact will they have in your opinion? AD: First of all, we are improving the visibility of our tournaments. The new “Grand Swiss” will be spectacular and attractive. This event opens the door to the Candidates Tournament for all young and talented players who have not yet made it to the Top-10. And it also represents an opportunity for all participants to improve by being confronted directly with world-class players. Moreover, we have reformed the Grand Prix Series. For the first time, tournaments will be staged with the knockout system, as in tennis. We are expecting to arouse interest from sponsors and journalists through this new format. All participants will be motivated to fight until the end, both for the qualification spots and for prizes in each event and the overall rankings. Another aspect I would like to broach is the importance of side events at such tournaments. Starting with the World Rapid and Blitz Championship in St Petersburg, and also here in Astana, we are making a point of cooperating with local organizers to have a program of parallel activities, like simultaneous, events for kids, blitz, etc. I consider it crucial to open the doors of a top tournament to all levels of chess players and fans, and thus to avoid seclusion. It improves the image of chess and attracts attention. YP: A last question related to the World Championship cycle, which has been sent to me by Mr. Leonard Barden, emblematic figure for chess in The Guardian: What has been done to try and build a friendly relationship with Rex Sinquefield and Garry Kasparov, since it is clear that an agreement could bring major benefits to chess? AD: I met Rex Sinquefield for the first time during the opening ceremony of the World Championship match in London and our short discussion was very friendly. Actually, my colleague of the management board Director General Emil Sutovsky has had intense consultations with Sinquefield’s team of the Grand Chess Tour, including Garry Kasparov, in order to adjust the tournament calendar. They have increased the number of events this year, so that coordination with the World Championship cycle was essential. All tournaments now have their place in the calendar 2019, and we basically avoided clashes of the main competitions, except for November which was completely unavoidable. But the smooth cooperation with the Grand Chess Tour allowed to minimize the damage for the players. Indeed, providing for the satisfactory distribution of all participants in the events of both cycles was fundamental. Both sides are happy and continue to work effectively. FIDE has big expectations for the upcoming World Championship and I hope that we will receive competing bids from many countries. YP: Thank you very much for the interview. On March 12, the FIDE President, the Treasurer and the International Director met with the Chinese Chess Association and the company representatives of Huawei Technology Co. Ltd. at the Huawei HQ in Shenzhen to discuss possible directions of partnership. President thanked China and the Chinese Chess Association for their contributions to the development of chess in China and in the world. Mr. Dvorkovich said that by all means, China is one of the strongest chess nations nowadays. In the afternoon, the President visited the Shenzhen MSU-BIT University and later met with the Governors of Shenzen where he discussed the cooperation between FIDE, the Chinese Chess Association, and Shenzhen City. Shenzhen is one of the best-developed chess cities in the country with 300 000 chess fans and 500 chess schools and academies. The city will soon be the second home of the Chinese national team. The OCA General Assembly in its meeting held in Bangkok on 3rd of March 2019 officially approved the dates for the 19th Asian Games to be held in City of Hangzhou, China from 10th to 25th of September 2022. The Sport of Chess has been officially included in the Sports Programme of the Games. President OCA Sheikh Ahmad al-Fahad Al-Sabah sent an official letter to FIDE President Arkady Dvorkovich. On the 7th - 8th March, Grandmaster Nigel David Short, of World Chess Federation (FIDE), visited Antigua as a part of his Caribbean tour to spread 'the gospel of Chess’. Despite being only 2 days long, Short’s short trip was very busy. He had an interview with Dave Lester Payne of Observer Radio and a meeting with the minister of sports, Hon. Daryll Matthew. From his meeting the minister expressed an interest in assisting the Federation in future endeavours. He also found the time to face off against a few members from the Antigua Barbuda Chess Federation (ABCF). In all, he played 13 games finishing undefeated with a score of 13 - 0. Nigel David Short is an English chess grandmaster who earned the title at the age of 19. In 1988, Short was ranked third in the world by FIDE and went on to become the first English player to play a World Chess Championship match in 1993. He has defeated 13 world champions, is a 3 times Commonwealth Champion and the only chess player ever to win tournaments in 6 continents. This is the latest in our series of analytical articles on past TCEC events. The main text can be read below on this webpage, and at the bottom you will find a link to the full layouted article in pdf format, including the important tables, graphs and images. TCEC Season 14 started on November 12th 2018 and introduced a number of changes from TCEC 13 (Haworth and Hernandez, 2019b). An enlarged Division 4 featured twelve engines and seven newcomers to accommodate the increasing interest in computer chess and this competition in particular. The other divisions remained eight strong. The five divisions played two or more double round-robins (‘DRR’) each with promotions and relegations following. Tempi gradually lengthened from ‘Rapid’ to ‘Classical’, and the Premier division’s top two engines played a 100-game match to determine the Grand Champion. The trio of STOCKFISH, KOMODO and HOUDINI have dominated the TCEC medals for several seasons and a key point of interest was whether others would reach the podium. LEELA CHESS ZERO and ETHEREAL were certainly expected to perform well in Division P, having shown remarkable improvement in the previous few months. KOMODO MCTS was a dark horse. There were a few nudges to TCEC’s adjudication rules. Draw adjudication could be invoked after move 35 (rather than move 40) and the two engines had to both evaluate within ±0.08 (rather than ±0.05) for eight consecutive plies and with plycount≠0. While draw-adjudication requirements were relaxed, win-adjudication requirements were tightened. Engine evaluations had to be outside ±10 (rather than ±6.5) for ten consecutive plies (rather than eight); plycount was not a factor. This change was welcomed by those of us who wanted to see a clearer demonstration of superiority on the board: it will be interesting to see how long it prolongs the decisive games and what mysteries remain. The common platform for TCEC14 consisted of two computers. One was the established, formidable 44-core server of TCEC11-13 (Intel, 2017) with 64GB of DDR4 ECC RAM and a Crucial CT250M500 240 GB SSD for the EGTs. The ‘GPU server’, a Quad Core i5 2600k, was sporting Nvidia (2019) GeForce RTX 2080 Ti and 2080 GPUs for those engines which could exploit them. Season 13 competitors BOBCAT, DEUS X, HANNIBAL and SENPAI rested for this TCEC season. TCEC welcomed first appearances for engines DEMOLITO, KOMODO MCTS, PIRARUCU, ROFCHADE, SCHOONER, SCORPIONN and WINTER, see Fig. 1 and Table 1. As for TCEC12/13, each engine played both White and Black from four-ply openings defined by the second author here. The results are as in Table 2: ‘P%’ is the %-score and ‘ELO±’ is the change to the engine’s nominal ELO based on its performance. Generic stats are in Tables 9 and 10. Online interest naturally focused on the newcomers, especially KOMODO MCTS (Chessdom, 2019), a further innovation from the Lefler/Kaufman camp. The engines had a wide range of ability leading to only 34.1% of games being drawn: those given a default ‘TCEC-entry ELO’ of 2900 ranged across the field. WINTER was always headed for a demotion spot. SCORPIONN clearly was not ready for the contest and even though it disconnected eight times, it did not impact the ranking elsewhere. The bottom three missed TCEC Cup 2 (Haworth and Hernandez, 2019c). The three engines promoted were clearly ahead: KOMODO MCTS, ROFCHADE and NEMORINO. Again, the eight engines involved played both sides of 14 prescribed four-ply openings. With GPU operating temperatures more stable, LCZERO was expected to do well after its performance in TCEC Cup 1 (Haworth and Hernandez, 2019a) and it did not disappoint, see Table 3. KOMODO MCTS also distanced the rest of the field and continued on up the divisions. Crashes remained a problem: this time, HANNIBAL incurred five. In game 26/7.2, ROFCHADE disconnected in a 7-man tablebase drawn position. In g93, NIRVANA retained the KBNPKRN draw for 101 moves but claimed the 50-move draw with 165. Bd6 – which loses to 165. … Nf7+ 166. K~ Nxd6. Do chess programs do irony? Game 64/16.4, KOMODO MCTS – LEELA, ended in a rare stalemate on m172. Game 93/24.1, NIRVANA–LEELA, was drawn at position 115b but a mate for Black in 29 moves when the 50-move draw rule intervened. Demoted GULL beat BOOOT and BOOOT beat LEELA which otherwise moved smoothly away to win the division again, see Table 4. The silver medal went to KOMODO MCTS, courtesy of one less loss to LEELA than XIPHOS and one more win to the rest of the field. The penultimate game 28.3/111 was the longest ever for TCEC Division 1 at 308 moves: ‘new wave’ LEELA versus ‘old guard, oldest brand’ FRITZ 16. The win is routine enough with rook and passed pawn against a half-sighted bishop but endgame solver FINALGEN (Romero, 2012) sees 20 moves before a clear win, a line that results in mate on move 337 at best (Haworth and Hernandez, 2019d). GINKGO surprisingly crashed four times and was disqualified so the formal results are slightly different from those of Table 5 even if promotions/relegations are otherwise unaffected. FRITZ never saw a win in this company and also was demoted to division 2. The line-up for Division P had only a semi-familiar look. After the TCEC13 podium trio of STOCKFISH, KOMODO and HOUDINI, we had the other survivors FIRE, ETHEREAL and ANDSCACS. Interest however centered on the newcomers LEELA CHESS ZERO and KOMODO MCTS, both bringing MCTS search to the game. The contest was three DRRs rather than the four of TCEC13. After the first round-robin, STOCKFISH had jumped out into the lead with four wins. After the first DRR, with colour-bias eliminated, STOCKFISH maintained a healthy lead and remained unbeaten, a feat shared with KOMODO and LEELA. Was the TCEC podium about to change? KOMODO MCTS had disconnected and lost twice against KOMODO in drawn positions. A third disconnection would be bad for both engines: disqualification for MCTS and elimination of Komodo’s crash-wins from the table. Game 64 saw STOCKFISH beat KOMODO, opening the door for LEELA. In game 68 at the foot of the table, ANDSCACS beat ETHEREAL with Black. At the half-way point, LEELA was edging the contest for second place and remained unbeaten. The fourth round-robin saw LEELA consolidate its second place with four straight wins against the tail including one as Black against ETHEREAL. The competition for second place remained open as STOCKFISH finally ended LEELA’s unbeaten run in the last RR4 game, g28.4/112. The fifth round-robin saw plenty of drama. LEELA lost as Black to both KOMODO and FIRE, the first having serious tie-break significance and the second being seriously unexpected. GPU fan-settings were thought to be a contributory factor but not enough to trigger replays. In game 33.1/129 v HOUDINI, KOMODO MCTS disconnected for a third time, was disqualified and relegated with its games discounted. Hopefully, Mark Lefler will sort out the technical problems for TCEC15. This restored LEELA to second place. With one round-robin to go, adjusted scores at the top were STOCKFISH well clear on 21, LEELA 16.5, KOMODO and HOUDINI 16. The second relegation spot was between ETHEREAL on 11.5 and ANDSCACS on 11. Every win was now going to be a major event, especially as the last round of 28 games started with seven draws. KOMODO as White lost to STOCKFISH in g37.4/148. Both LEELA and KOMODO beat FIRE. In the penultimate game, KOMODO beat ANDSCACS: ETHEREAL breathed again, having narrowly survived without a single win in this division. In the last game, a cliffhanger, STOCKFISH searched the endgame tables a thousand times more than LEELA and thought it had a feasible advantage, but LEELA held out in KRPPKRP to draw on move 93. The raw figures of Tables 6 and 7 need adjustment because KOMODO MCTS’ disqualification flipped the ranking at both ends of the table. In fact, STOCKFISH ultimately had 25 points, LEELA 20, KOMODO 19.5, ETHEREAL 14 and ANDSCACS 13.5. The ‘big three’ became the ‘big four’ but the Shannon-AB engine mould was cracked again: the still-improving LEELA had remarkably progressed from Division 3 all the way to the TCEC Superfinal. As in TCEC13, a knockout event was interposed between this tournament and the Superfinal. Would the LEELA team roll out an improved network in preparation for the big finish? A hint came in a ‘bonus match’ between a more recent ‘LEELA 32585’ and ‘STOCKFISH 8’, the latter having only 12 threads and a 4M hash-table. This was an echo and ‘simulation’ of the ALPHAZERO–STOCKFISH match: LEELA won +24=71-5. We reported on TCEC Cup 2 separately (Haworth and Hernandez, 2019c). TCEC’s ELOs suggested a STOCKFISH win by eleven. However, both engines came to the board in new versions: the match was now STOCKFISH v190203 versus LEELA v20.2-32930. There was bound to be a clash of styles occasioned by the different modes of evaluation and use of hardware. This dynamic was eagerly anticipated with viewer numbers often topping 2000. Jeroen Noomen (2019) again created a suitable opening book, aiming as before for at least 20% decisive results. Assaf Wool returned from his ‘TCEC Cup break’ to comment on all the games. GMThechesspuzzler and Kingscrusher were active on Youtube (Wool (2019) picked out positions from games 7, 8, 10-11, 13, 16-17, 20-22, 25, 27, 29, 35, 41, 49, 53, 55, 58, 63, 65-66, 71, 75, 80, 85 and 87. Kingscrusher (2019) commentated on games 7, 10-11, 13, 16, 17, 53, 66 and 85. Games 2, 7-8, 13, 17 20, 29, 49, 65-66, 80, 85 and 100 were covered by GM Thechesspuzzler, 2019). Soren Riis provided the authors with detailed analysis of games 7-8, 20-22, 65-66 and 71 which we provide via our pgn file for reader convenience rather than here. GM Matthew Sadler (2019), having analysed the STOCKFISH–ALPHAZERO games (Sadler and Regan, 2019) has also contributed his own view of this Superfinal. The play and the results did not disappoint. STOCKFISH opened its account with wins from games 7 and 10 but LEELA replied with wins from games 11 and 13. There were twelve wins in the first thirty games, a hit rate of exactly 40%, see Table 8 and Fig. 2. At this point, the score was 15-15, suggesting that this would be the closest TCEC Superfinal since Season 5 in 2013 even though LEELA had never led. The same situation appertained at 24-24 after a run of 19 draws (not a record: the TCEC8 KOMODO 9.3x – STOCKFISH 021115 Superfinal games 14-37 and 47-71 were all draws). At this point, LEELA dramatically jumped out front with wins in games g49 and g53. This lead held until game 80 which STOCKFISH won. Ultimately, it was the single 0-1 win in another sea of 19 draws that allowed STOCKFISH to retain the title. Each game was closely contested with average length being one ply short of 100 moves – and not just because LEELA was reluctant to visit the draw zone. Of course, suitably equipped grandmasters could write a book about this entirely gripping match and this would be most welcome. Here, we can only pick out a few chessic highlights which perhaps complement the analyses of the commentators above. The hints from the evaluations of STOCKFISH suggest that it welcomed LEELA’s 15. Bb2 (g07), 51. … Be3 (g08, a missed win), 34. Kf1?? (g21) and 31. … Qd6 (g22). In game 35, 29. Ke1 rather than h7 seemed to lose LEELA’s winning advantage. Game 58 was adjudicated with a rare ‘mate in one’ on the board: the camera cut away just before the blow was struck. Game 63: LEELA was happy to trade pawns for position as early as eleven moves into the play. STOCKFISH did not see a serious problem until six moves later. LEELA create a passed pawn despite being three pawns down and this led to a crushing 41-move win, the shortest of the match. If there was a pivotal juncture in this Superfinal, it was games 65-66 – a crucial one or two-point swing to STOCKFISH. In game 65, LEELA missed a KNP(c4)P(d5)KBP(c5) win with the winning capture admittedly 26 moves down the line (de Man, 2018). STOCKFISH clearly saw it was lost and LEELA would have been awarded the win under the TCEC13 ‘6.5+’ win-adjudication rule. LEELA was within 11 ply of winning with 9 ply to go and it is worth speculating as to how soon it would have found the winning idea, K on b5/c6 before Nxc5, had the plycount not intervened. Game 66 had to be restarted after two server crashes before LEELA – lost. Had it been possible to return to the game-state after the last completed move, the temperature of the partisanship in the chat room would have been lower. A minor cost, but transaction-checkpoint/restart might be applicable here. Game 85 was the final win: the 12-move King’s Indian opening had already defined the major asymmetry of Queen versus BBPP. LEELA went from apparent equality to negative territory by move 25. Ultimately, LEELA’s QR were unable to prevent mate by a BBNNPP team, only five moves away when the referee stepped in. Game 86 was the longest ever TCEC game at 362 moves. TCEC treated us to two bonus events at the Rapid tempo of 12′+3″/move. The first featured the top four - HOUDINI, KOMODO, LEELA CHESS ZERO and STOCKFISH: 20 DRRs, 40 round robins, 120 rounds and 240 games. STOCKFISH had a good first half and was never headed even if pursued closely by LEELA. HOUDINI and KOMODO tailed off, eventually in that order as KOMODO fared poorly in the second half. ELO-predicted net scores were +9/+1/-2/-8 but ‘actuals’ were +12/+6/-7/-11. The longest wins were g116.1 (1-0, 139 moves) and g37.2 (0-1, 125m): the longest draw, g12.1 (318m). Game 18.1 between Leela and Komodo was something of an anti-climax as a 3x-repetition draw after ten played moves. Full details are included with the repository e-version of this note (Haworth and Hernandez, 2019d). The second event was a 100-game STOCKFISH–LEELA match from the initial position: no prescribed openings. LEELA won 16-4, perhaps by being single-minded about its openings (Wool, 2019). The Google DeepMind company in St. Pancras, London have been remarkably open in sharing the core ideas of their intelligence initiative. In the year it has taken for DeepMind’s papers on ALPHAZERO (Silver et al, 2017/18) to mature and satisfy the referees, we have seen TCEC invest in Nvidia GPUs and foster several innovations going beyond the classic Shannon (1950) minimaxing AB model of a chess engine. We have seen a leading chess-engine author, Mark Lefler, move his focus successfully from top engine KOMODO to KOMODO MCTS (Chessdom, 2018). With one less technical break, this engine would have come all the way through the divisions to fully justify its place in Division P at the first attempt. We have also seen a community come together to support and train the open-source LEELA CHESS ZERO echo of ALPHAZERO. Again, this has been rewarded by success, and how. LEELA edged out KOMODO and HOUDINI to take the challenger’s place in the Superfinal here. It was not expected to beat STOCKFISH but came within one game of drawing the classic phase. Chess24 and Chessbomb, with its useful colour-coding of moves, covered the TCEC14 Superfinal so we were treated to kibitzing by three different, objective but hardly neutral versions of STOCKFISH. The Twitch TCEC channel claims that viewers’ computers have to date had a window open to TCEC Seasons 10-14 for a total of over half a million hours. CPW (2019). https://tinyurl.com/icga046. The Chess Programming Wiki website, including biographies of engines, authors and developers. Chessdom (2018). http://tinyurl.com/icgak034. Interview with Mark Lefler and Larry Kaufman. de Man, R. (2018). http://tablebase.sesse.net/syzygy/. Site providing sub-8-man DTZ50″ EGTs. ‘GM Thechesspuzzler’ (2019). https://tinyurl.com/icga056. Superfinal video-commentaries. Haworth, G. McC. and Hernandez, N. (2019d). http://centaur.reading.ac.uk/82052/. TCEC14: the 14th Top Chess Engine Championship. Submitted to the ICGA Journal. Intel (2017) https://tinyurl.com/icga042. Intel’s specification of the XEON® E5-2699V4 processor. Kingscrusher (2019). http://tinyurl.com/icgaj057. Superfinal video commentaries. Noomen, J. (2019). https://tinyurl.com/icgaj054. JN’s approach to the Superfinal openings. Nvidia (2019). https://www.nvidia.com/en-gb/geforce/graphics-cards/rtx-2080-ti/ GEFORCE GTX 2080 TI GPU specification and benchmark performance data. Romero, P. P. (2012) https://tinyurl.com/icga013. FINALGEN: tutorial, download and forum. Sadler, M. (2019). The TCEC14 Computer Chess Superfinal: a perspective. Submitted to the ICGA Journal and https://tinyurl.com/icga055. Sadler, M. and Regan, N. (2019). Game Changer: AlphaZero’s Groundbreaking Chess Strategies and the Promise of AI. New in Chess. ISBN 978-90-5691-818-7. Shannon, C. E. (1950). Programming a Computer for Playing Chess. The London, Edinburgh and Dublin Philosophical Magazine, 41(314), 256-275. https://doi.org/10.1080/14786445008521796. Silver, D. et al (2018). A general reinforcement learning algorithm that masters chess, shogi, and Go through self-play. Science, 362(6419), 1140-4. doi: https://doi.org/10.1126/science.aar6404. Wool, A. (2019) http://mytcecexperience.blogspot.co.uk/ TCEC blog. FIDE is pleased to announce the final list of Men participants in the IMSA World Masters Championship-Hengshui, China 2019. Leinier Dominguez received the wild card nomination from FIDE President.